This holiday tradition has been going on for some time - about ten years. 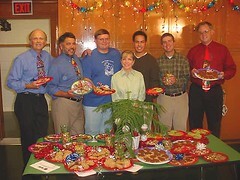 A couple of years ago we were even featured on The Food Network on a Sara Moulton Holiday Special! Here are a few behind the scenes pictures of the shoot at my house and in my classroom. On that site you will find lots of mouth watering pictures, recipes, tips, complete instructions - even a song! So do stop by, and by all means, join in! There is now of course a wiki: menbakebetter.wikispaces.com It has just been started up, and we hope to hear from others joining in on the fun. Please feel free to contribute, add pictures of your own exchange, recipes, maybe a podcast of your exchange - the sky's the limit! This is for real. Our exchange at Arbor Heights this year is scheduled for December 13th after school. We should have six bakers this year, which will be great. There are times when you just have to throw political correctness out the window, and have some good fun. Please - spread the word!